Tax lien certificate investing has existed in the United States for more than 200 years. Sometimes people can’t or simply won’t pay their property taxes. The local government needs the money from the property taxes to provide local services like pay for the schools, the police departments, fire departments, roads, and local courts and county employees. Selling tax lien certificates to investors gives the government the money it needs to operate. In exchange the investor who buys the certificate by law receives the original investment plus interest when the property is redeemed. If the owner does not pay the taxes the tax lien certificate investor has the right to foreclose on the property for only the cost of the unpaid taxes. 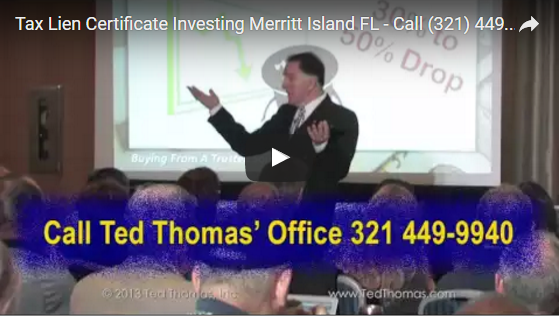 Next you’ll see a video from a recent workshop conducted in Canada where I described part of the process of investing in tax lien certificates and getting a high annual rate of return of 16%, 18%, up to 36%. You’ll find more information about investing in tax lien certificates on my website. Go to tedthomas.com. All right, so this investment opportunity you’re going to lock in these rates an these aren’t the rates that real banks make these are the rates that are going to pay on the different tax certificates. Okay, so stock market I’m not negative on the stock market. Stock market is okay, people make millions of dollars but simply you’re going to have to spend some time learning. You’re going to have to spend some time learning this and that’s what you’re here for and so that’s what we’re going to give you a lot of over the next 3 years. Okay, I’m a real estate guy and I love real estate and I’ll tell you a little bit about Florida and I’ve said this before but I want everybody to get the point. In Florida right now, Florida is a state of about 18 million people, 18 million and the real estate values in the northern part of the state especially have dropped anywhere from 40% to 70%. So if you had 400,000-dollar house it could be worth 100,000 dollars today. A place like Orlando, Florida which is a boom town, Orlando is a boom town. The two biggest boom towns in the state are Orlando because of Disney and Las Vegas because of the gambling those are the two cities that are down the most. Okay, Las Vegas, the market dropped up more than 70% it’s starting to come back but one of my associates sent me a note yesterday said *0:02:11 tell your classes. The hedge funds moved in to start buying in Las Vegas believe it or not the hedge funds are bailing out of Las Vegas. They will buy in low so they can make profits and they can’t make the profits so they’re bailing out and dropping them even lower that’s in Las Vegas. Now Orlando has right now the 3, Orlando is made up of 3 counties called Orange County, Osceola County, the Seminole County. There’s over 20,00 foreclosed properties and about 8,000 of them have been abandoned already in Orlando in the boomtown. These houses are 4 or 5 years old. So a lot of those houses the banks will never pick up, investors will never pick up, they’ll go to the tax auction. So this is just going to be more and more as we go on. All right, so some people make money every time and that’s what we’re all here for and that’s why I want you to learn about these tax certificates. If you’re a conservative investor which is a natural thing if you’re born and brought up in this country and you live in this country. Most people in the provinces are very, very conservative so this is the kind of investment you want to be thinking of. We’re going to teach you both sides but this is a super simple investment. You invest with the government you get a check back from them. So learn how to do tax certificates. Don’t just say, oh no, that’s not enough for me because you’re going to see people making thousands of percent profit instead of that 16 to 18 that I’m going to teach you about. So this 16 and 18 is steady money. If you just get towns that you’d like to go like many people here will decide I want to go to Arizona because it’s a 2-hour flight. They can be in Arizona all those counties sell tax certificates. You might just want to do that but we’re going to teach you both ways to do it. Okay, so tax certificates have been around for well over 100 years closer to 200 years and anybody that wants to buy one can buy one and we’ll show you how to do it, I’ll show you how to do it buying from 50 dollars and 500 dollars and things like that. Okay, so when you buy that tax certificate, when you buy this simple piece of paper, when you buy that the government puts you in the first lien position. So they don’t care if you came from Paris, France, if you came from Jakarta, if you came from anywhere of the provinces they don’t care where you came from your name is now on that property and the property can’t be transferred, it can’t be sold, nothing can happen to that property until you get paid. Is that a good thing? Okay, so that’s how secure this investment is. You don’t have to do anything all you have to do is buy the certificate. When you register on that certificate then your name is in the county records in that property. Nothing can happen until you get paid that’s the beauty of the investment. And so you can’t have them buying for me, you can’t buy them from other people that have certificates, you can buy theirs and replace them, and you can sell your certificates. By the way, if you buy the certificates and you want to sell them you can sell them. I’ve had people sell 500 to 600 a day they’re going to buy them and then they sell them and that’s okay. It’s perfectly legal to do that.